Do you have happy childhood memories of pulling around, or being pulled around in a wagon? Do you want your little ones to have the same experiences to treasure for life? With so many to choose from which are the best kids wagons? My little ones love their red wagon. They pull their toys around in it when we’re at home and enjoy riding in when we’re out. I have to admit I love it as well. It’s so much easier to have the kids, all their stuff, and anything I need in one place. Much easier than a stroller with kids inside, or walking alongside, and bags hanging from the handles. Let’s look at why you should get a wagon, what to look for, and our top 10 picks. We ♥︎ honesty! Mom Loves Best earns a commission through the hand picked links on this page at no extra cost to you. Use the links above to check the latest prices or read our in-depth kids wagon reviews below. Why Do I Need a Push Wagon? 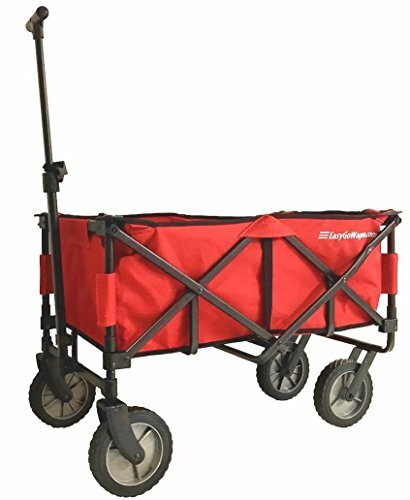 How Do I Choose a Push Wagon? These versatile workhorses offer a great alternative to a stroller and give you the chance to carry things easily. You can get the kids, the picnic, some of their toys and more in some wagons. Kids also love wagons, whether it’s pulling friends around or sitting inside with a friend or sibling. Even the little ones can have their own wagons. You can take a wagon along when you head to the beach, the park, on the trail, around the neighborhood for a stroll, or when trick-or-treating. 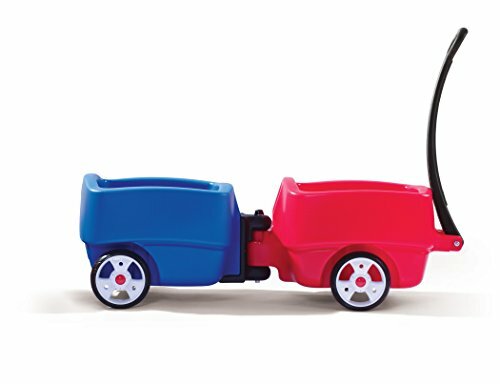 Toy transport: A wagon is a great place for your little ones to transport and store their toys. It could be from the bedroom to the family room and back, around the yard or on trips out. It can also get little ones used to clearing up after themselves. Exercise: Wagons can give your kids a workout. Whether pulling or pushing, it will engage many of their muscles and build strength. Pulling a wagon full of toys around is hard work and will leave them pooped (source). Walking aid for toddlers: When your little one finds their feet, they’re going to want to be on the move. Some wagons double as push toys and walkers for younger children. Deciding what you want from a kids wagon can help you choose the best one for you. Here are some things to take into account before deciding. 1. What Will You Use the Wagon For? Decide exactly what it is you want your wagon for. It might just be to pull your kids along in when they’re tired or to use instead of a stroller. You may want it to transport more than kids when heading to the beach or going shopping. Do you want a wagon that doubles as a toy for your kids? There are many types to choose from and narrowing down your intended use can help you choose which will be right for you. There are fixed and foldable wagons, some with or without seats and some with or without canopies. Some will carry one or two kids and others might be a wagon for three toddlers or older kids. You can get motorized wagons, but these tend to be designed for transporting heavier loads, not for kids. 2. What Material Should You Choose? Wagons are usually made from plastic, canvas or other fabric, wood or metal. In general plastic, wooden, and metal wagons are not collapsible, although there are exceptions. If you want one, you can fold up when not in use then choose a fabric one. 3. Where Will You Be Using Your Kids Wagon? If you plan on using your wagon around the home, on sidewalks, paved pathways, or in the yard, then either rubber or air tires will work. Planning on using your wagon on rougher terrains, or at the beach? Look for wider tires or ones that are filled with air. They may be more forgiving, but also liable to puncture. 4. Do You Need a Wagon with a Canopy? Some wagons come with a canopy included and others have them available for purchase. If it’s often sunny where you live and you want extra shade and protection for your kids, choosing one that comes with a canopy can be more cost-effective than adding one later. Many canopies can be removed for storage, or when they aren’t needed. Think about how much, or how many kids you plan to put in your wagon. Some wagons will carry well over 100 pounds, while others recommend a lot less. There are wagons designed with seats, to carry two toddlers. If you need a wagon for three toddlers or more, or for older kids, then a utility wagon might be a better option. The other consideration when it comes to weight is how heavy the wagon is. If you want to pop it in the trunk of the car for road trips, then a lightweight foldable option would be best. These could also be ideal if you don’t have much room to store it at home. 6. What Extras Do You Want? Do you want your wagon to double as flatbed transport? Do you want drink holders and extra storage space? Maybe you need seat belts for little ones. These are all things that can be found in some models. Some have plastic molded or cushioned seats, or they may even have a table or flatbed for kids. Some have removable sides and others have foldable handles for storage. There’s a wide range of choice for kids wagons. Depending on what you’re after, you’ll want to get something to suit your family’s needs. Here are our top picks. Do you enjoy going out on the trail with your kids, but find a stroller just can’t cope with the rough terrain? A wagon that has wheels which can deal with grass, mud, and gravel, as well as sand and flat surfaces, could be what you need. 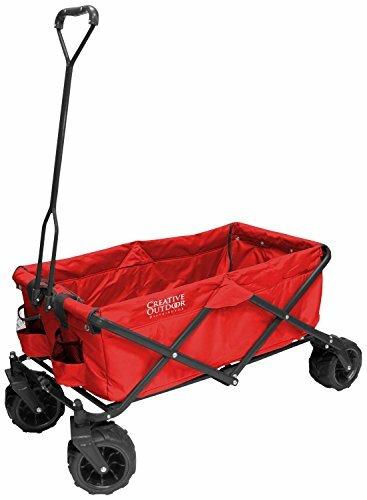 Radio Flyer delivers here, with this all-terrain wagon. It has seating for two kids, with seat belts and a canopy to shade them from the sun. It can be converted to a flatbed and has covered storage spaces when a seat is folded. There are also four cup holders for water bottles and drinks. It measures 41.5 inches by 21.75 inches by 13.75 inches and weighs 32.5 pounds. The all-terrain tires are air-filled for the comfort of the rider and maneuverability. This wagon is a snip to pull around and steers easily. The pulling handle is comfortable to hold and long enough that you won’t get backache from bending to pull the wagon. Suitable for children from 18 months upwards. Seats can fold flat to be used as a sleeping area or for diaper changing. Tires work well on many different surfaces. Some moms find the canopy fixings can be weak and the canopy is unstable. Wagons are great but can often be difficult to store. They take up a lot of space in the back of the car, and home storage can be a nightmare. A wagon that’s lightweight, collapsible, and can be stored easily could be the answer. EasyGo brings us a durable, collapsible wagon for your kids. It can also double as a utility wagon for tailgating, picnics, camping, working in the yard or going to fairs. With a 120 pound capacity when opened, it folds to a mere eighth of its original size. This makes it easy to store in the back of a cupboard, and it won’t fill your trunk when you put it in the car. It’s also lightweight, at about 21 pounds. This makes it easy to pack away and carry when not in use. The wagon comes fully assembled; simply open and go. This is great if you hate the hassle of putting things together when they arrive. Wide base rubber wheels are great for stability and coping with different terrains. The front wheels also swivel, making steering a breeze. You can load your wagon with the kids, their toys, and the picnic, and not worry about it tipping. Available in two colors, red and blue. Handle locks in an upright position, avoiding trip hazards. No seat belts for kids. Might not work as well on sand or soft surfaces. Wagons are not just for adults to tow kids and supplies around. They can also be a great aid to a baby when they first start to walk. It can help them traverse the areas between the sofa and the chair they’re using for support. Push toys are great for little ones finding their feet. 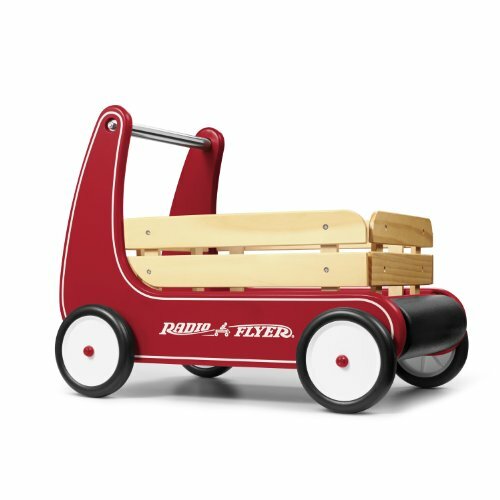 This classic infant wagon from Radio Flyer has a push-resistant feature to adjust the speed, making it ideal for budding walkers. It’s suitable for children from 12 months to 4 years old. With a 35-pound capacity, it measures 22.44 inches by 14.57 inches by 17.13 inches. Plenty of room for little ones to store toys to push around the home, or take for a walk in the yard. Made from wood, it has detachable sidebars. Worried about your little one crashing into the furniture and damaging it? Radio Flyer has it covered with a bumper on the front to prevent knocks. If you have more than one child, they’ll enjoy pushing each other around in this wagon. Sturdy for little ones to pull themselves up. Some moms said the “push resistant” feature doesn’t work well, and makes a clicking noise. Little ones love having things “just like mom and dad.” It fuels imaginary play and makes them feel grown up. 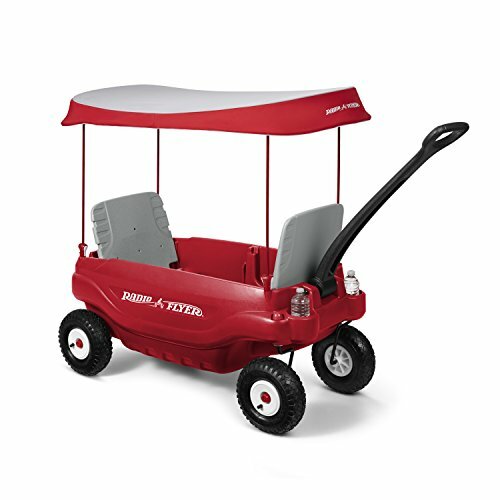 Toddlers would love a red wagon, just like the one they get pulled along in, which they can fill with teddies. 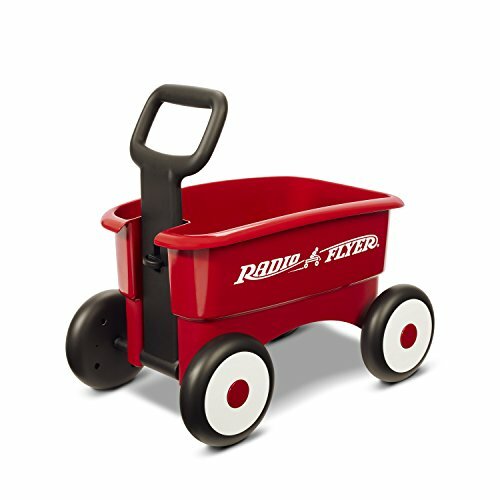 Radio Flyer makes our top picks again, which is no surprise as the company produces some great wagons. This two-in-one can be used with the handle locked as a push toy to help a toddler walk. It converts to a pull wagon when they’re a bit more confident. In classic red, it can carry up to a 35-pound load and measures 19.3 inches by 11.8 inches by 18.5 inches. It’s suitable for children between 1 and 4 years old. The wide wheelbase makes the wagon stable and the large wheels glide easily over carpet or wooden floors. This makes it easy for your toddler to load it up with toys and pull them around the home. Talking about loading it up with toys, the storage area is deep, letting them put teddies, shape sorters, and many other toys inside. They can take them out and play with them, then pop them back and return them to where they belong. Plastic construction with no sharp edges. Lightweight, weighing only 4 pounds. Sturdy enough to be used in a yard. Too small for most children over about 3 years old. Some find the handle very short. Imagine being able to combine a top class stroller with a wagon, and one that can accommodate infants, toddlers, and older kids. You can have the best of both worlds for your kids and for carrying all the other paraphernalia you need. A superior quality stroller wagon, it’s the Rolls Royce of wagons. It can accommodate many brands of infant car seats with an attachment, and has a three-point harness for toddlers. Included are a removable snack and drinks tray, and two cup holders. More accessories are available at an extra cost. These include a retractable canopy, five-point harness comfort seat for a toddler, a foldable storage basket and a travel bag. There’s even a nap system for little ones to sleep on the go. The aluminum frame supports the fade and stain-resistant side walls. The adjustable handle has performance grip and the wagon can be pushed or pulled. There is suspension on the large front tires and a one-touch foot brake. Expandable footwell for taller kids. Lockable handle to push wagon. Some find the accessories lacking in quality. Double the trouble, double the fun, but having twins has its challenges. Finding a wagon to accommodate two children comfortably is a must. If you have triplets, or twins and another child, then the challenge increases. But we’ve got a solution. The Step2 choo choo wagon will delight your kids with its train of wagons. The classic edition is supplied with two trailers but additional classic trailers can be purchased separately. This is great when you need a wagon for three toddlers, four toddlers or a maximum of five toddlers. Each carriage has a seat belt to keep your little ones safe as you pull them along. There is also a cup holder molded in each trailer for your toddlers to store their drinks, and the footwell is roomy. The seat in the front carriage can be lifted for storage or you could use an extra carriage for storing a picnic, toys or other supplies. Made from plastic with rubber wheels, each car has a weight capacity of 50 pounds and measures approximately 15.5 inches by 32 inches by 19.5 inches. It’s suitable for kids aged between 18 months and 5 years, but pulling along two or more 5-year-olds might be a full-on workout! Can be added to for accommodating multiple kids or storage. Each child has their own carriage and space. Some moms find there is a limited turning radius and it’s difficult to back up. Might not be suitable for taller parents to use. As your kids get a bit older they might also want their own wagon. Maybe they have younger siblings they’d like to pull around or they could just want to help out when you go on trips. Look for a wagon that’s suitable for them, but sturdy enough for you to pull them along when they get tired! 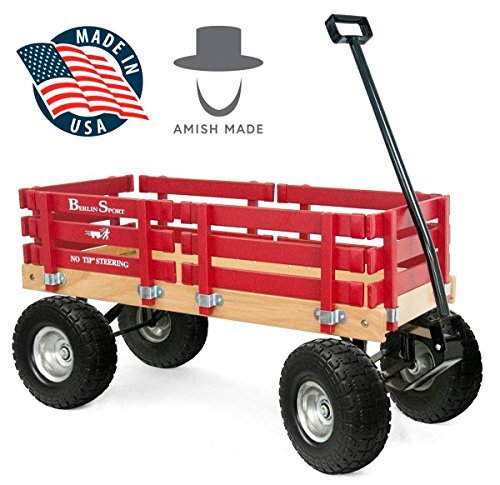 The Amish-made Berlin Flyer is a sturdy solid hardwood wagon which older kids will love. It can carry a 300-pound load, making it perfect for even “big kids,” and yes, by that I mean you! Apparently, this wagon is even owned by royalty. Michelle Obama chose it as a gift for Prince George. I wonder if it’s being used to pull toys around the palace? The large body measures 36 inches long by 7.25 inches wide and 9 inches deep. The hardwood painted rails can be removed, allowing it to be used as a flatbed, or as a seat, as you sit fishing at the lake. No-tip steering makes it easy to pull around and the 10-inch, foam-filled, “no-flat” tires can cope with different terrains. This wagon will grow with your kids all the way to adulthood. Don’t expect them to leave it behind when they leave home. Many find the tires have a strong smell when it’s new. Protection from the sun is always at the forefront of our minds when it comes to our kids. Their delicate skin needs safeguarding from damaging UV rays. 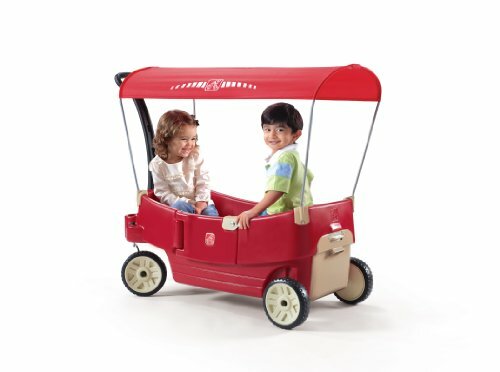 A canopy on your wagon will provide shade while you’re out and about. This wagon has plenty of storage space for the extras you take with you and your kids. It has a compartment in the rear for snacks, and six drink holders. The door set in the side makes it easy for little ones to climb in and out, and latches for safety. It can accommodate a weight capacity of 75 pounds, which is plenty for two little ones. It measures 41 inches by 19 inches by 39.5 inches, and weighs 24 pounds. The plastic construction makes it sturdy but lightweight. The seat platforms fold to form a seat, table or flatbed, and there’s a canopy included to keep your kids shaded. The canopy is easy to attach and remove. Safety latch on the door. Handle folds under the wagon for storage. Requires assembly; some users said the instructions are hard to follow. Is the beach one of your favorite places to go? Are you forever carrying kids, blankets, towels, picnics, toys, and umbrellas? A wagon which can take the load and also steer well on sand should be right up your alley. This foldable wagon will easily fit in the trunk of your car when you head off to the beach. Opening it for use is a breeze, with no tools required, and it can carry up to 120 pounds. You can load it up with the kids and everything else you need for a day out. It measures 36.5 inches by 23 inches by 24 inches, and weighs 23 pounds. The best thing about it is the wide 360-degree swivel wheels, which let you navigate the wagon over the sand. Besides the beach, this wagon can also cope with being hauled around many other terrains. 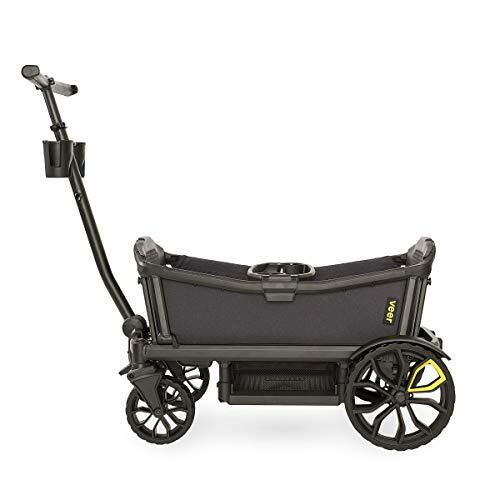 The 100 percent denier fabric and steel frame provide support for your wagon. There are a couple of handy pockets, which are ideal for a cell phone, keys, wallet or other small items. Travel sleeve for protection when storing or transporting. Removable liner for washing and de-sanding. Flip open side storage pockets. Some mentioned having difficulty moving the rear wheels into position for folding away. Wagons can be cumbersome, especially when you want to put them in the trunk of your car. One that has seats for your kids as well as storage, and folds compact as well, is a bonus. It can also help with storage at home when not in use. Little Tikes brings us this folding wagon for kids, complete with seatbelts, four drink holders, and storage. There are two seats for your little ones to ride high and see what’s going on around them. When your toddler is happy to walk, or you have larger items to haul, these can be folded away to make a flatbed. It measures 24.9 inches by 57.8 inches by 33.1 inches and weighs 21.9 pounds. It folds easily and has a carrying handle built in, making moving it around a breeze. Suitable for children from age 18 months to 5 years, this wagon will last quite a while. It’s also light enough for kids to load with toys and pull them around. Sits high so can be pulled over curbs. No latching mechanism to keep the wagon closed when folded. 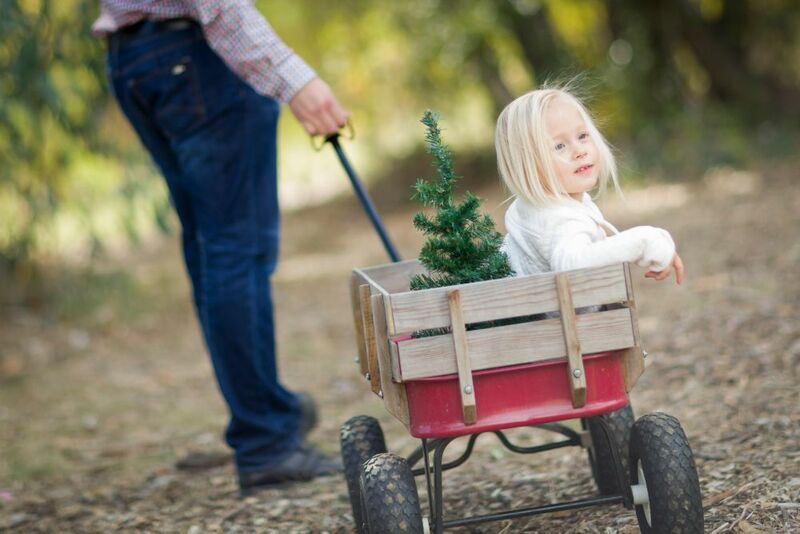 Wagons have been loved by kids and adults for generations. They’re a nostalgic item we all associate with childhood. From classic, basic designs to luxury models, there’s sure to be one to suit every family. 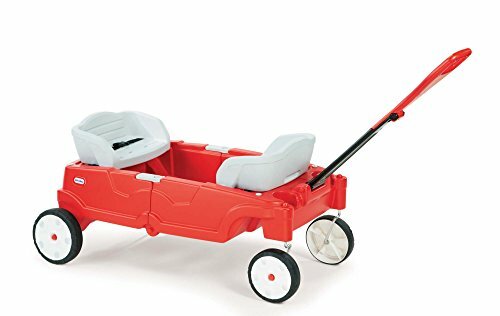 Of our top 10, my favorite is the Radio Flyer deluxe all-terrain wagon. It ticks all the boxes, from storage to steering to versatility. We hope you enjoyed our guide to the best kids wagons and found one to create memories for you and your kids. Please leave us a comment — and don’t forget to share! Jenny Silverstone is a professional writer, editor, and most importantly, the loving mother of two. Jenny's goal at Mom Loves Best is to help the other moms like her who are struggling and trying to do their best but feel totally overwhelmed. What are the Best Baby Bouncers of 2019?